It’s pea season these days, and I couldn’t be happier about. I love green peas, in just about anything and everything. I love green pea guac for its lightness and texture. I love throwing peas into parsnip rice or quinoa. And lord knows I love green pea hummus–so much that a variation of this recipe ended up in my first cookbook. 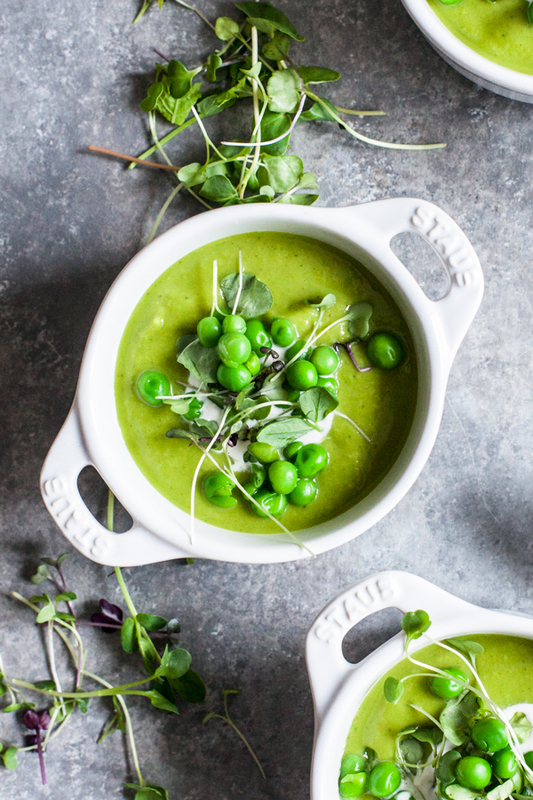 My latest favorite, though, is this silky vegan minted pea soup with cashew cream. It’s simple, elegant, and a perfect way to celebrate the season. Part of what I love about the soup is its simplicity: a quick sauté of spring onions and shallots, the addition of peas, and then a spin in the blender. That’s pretty much all it takes to get the soup on the table. My cashew cream helps to give the soup some creaminess and richness, and you can use extra for swirling and garnish. If you’re allergic to cashews (or you don’t have time to make cashew cream), you could try coconut milk or soy milk in the soup instead. I could have multiplied the herbs in the soup (it’s tempting, with so many fresh herbs popping up at the market), but I think that sticking to mint and parsley allows for bright, clean flavor. You can add extra flavor by using chives as a garnish, or you can use microgreens or pea tendrils instead. Both make for a lovely presentation! Heat the olive oil in a soup pot or Dutch oven over medium heat. Add the onion and shallots. Cook until the onions are clear and soft (about 5 minutes). Add the salt, pepper and broth, and bring the broth to a simmer. Add the peas. Simmer the peas for 10 minutes. Transfer the peas to a blender. Add the mint and parsley. Blend the soup until it's silky smooth. Transfer the soup back to the pot. Stir in the cashew cream. Check the seasonings and adjust to taste. If the soup is a little too thick for your liking, add a splash of additional vegetable broth. Divide the soup into bowls and garnish with a sprinkle of chives and a little swirl of extra cashew cream. Serve. The first time I made this soup, I served it as an appetizer. Steven and I were having family over, and it was a hit. 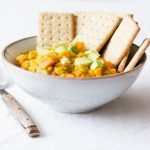 If I were enjoying it for lunch or dinner, I’d pair it with a grain or legume salad, a farro or rice risotto, or perhaps a grilled tofu + roasted veggie dinner. 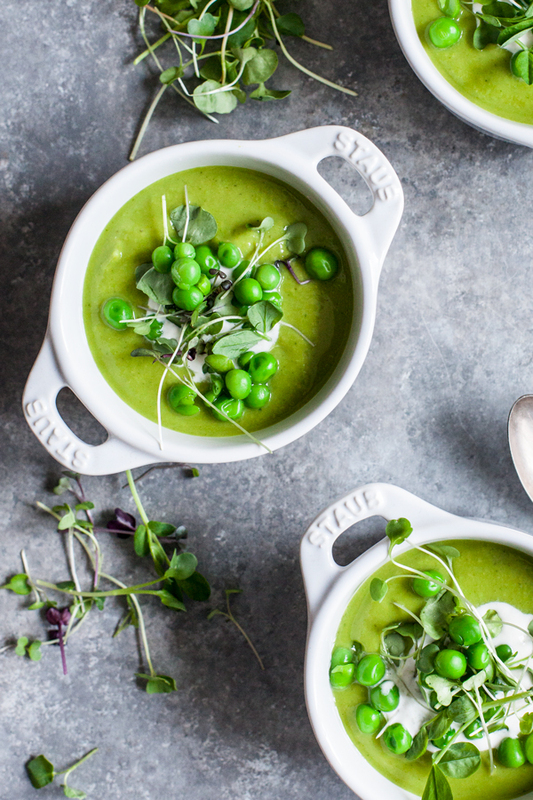 No matter how you’d like to serve the soup, I hope you’ll have a chance to savor it before pea season is behind us. If you try it, let me know what you think! On that note, I wish you all a great Tuesday. I’ll see you soon, with a new breakfast recipe in hand. Yes to peas! This looks just perfect and I’m loving the soup bowl almost as much as its contents. 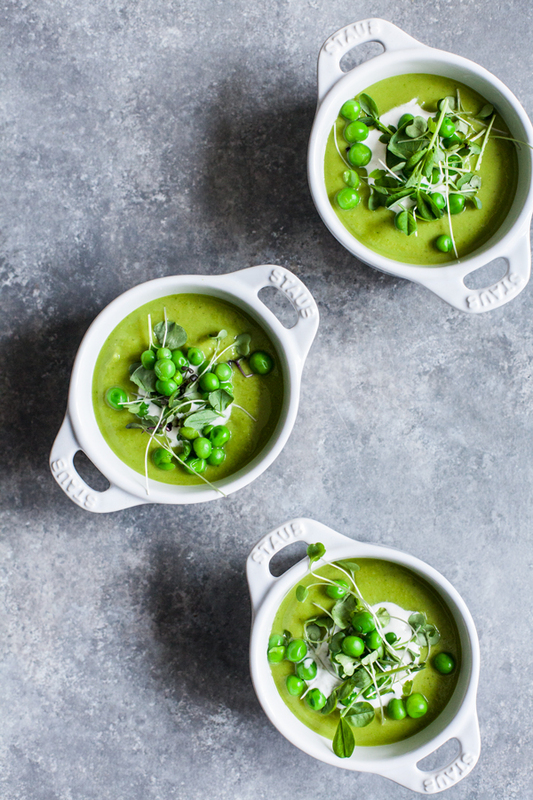 With this recipe, you settled an ongoing debate in my relationship: that peas and mint go together. The beau makes fun of me SO hard for suggesting this combo and I kept telling him I was right. Definitely making this next week to prove how delish these two flavors can be! So pretty! I am guilty of under-using peas. I do like them, but am mostly bewildered as to how to eat them beyond plain. This looks very special but so easy though. Peas AND cashew cream?? I’m in. By the way, you have so inspired me on my journey of healthy eating — and getting me to dive into the world of raw and vegan cooking — that I nominated you for the One Lovely Blog award (nomination post here: http://healthylittlechanges.com/2015/04/21/a-blog-award-plus-my-10-favorites/). Thank you for inspiring me and sharing such mouth-watering recipes!! Lindsay, I’m so touched and flattered! Thank you! That’s a stunning bowl of soup! And that swirl on top is so perfectly done! This looks amazingly good, gorgeous pics. The color is so vibrant, thanks! 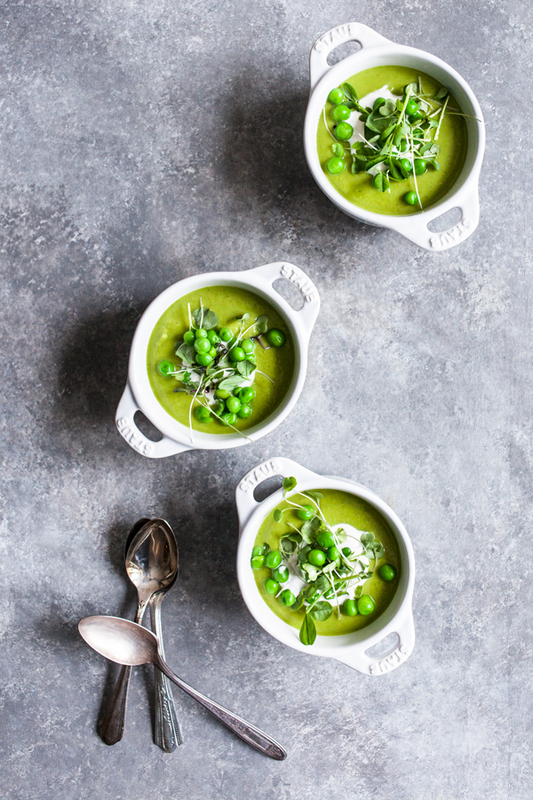 This soup screams SPRING! I am so excited to make this and dig into its bright and fresh flavors. This looks lovely! I love my greens. Never had cashew cream before, I must try it. Thanks Gena! 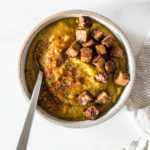 I have been on a soup grave lately, this is a must try recipe! Mint with peas, never thought of that combo but it sounds great! I am going to give this a try.